The pale rock in the upper center of this image, about the size of a human forearm, includes a target called "Esperance," which was inspected by NASA's Mars Exploration Rover Opportunity. This image is a composite of three exposures taken by Opportunity's panoramic camera during the 3,262nd Martian day, or sol, of the rover's work on Mars (March 28, 2013). The venerable Mars rover Opportunity, the older and smaller cousin of Curiosity, has discovered another water-weathered rock hinting that the Red Planet could have supported life in its ancient past, NASA officials said. In its last days exploring "Cape York," a site on the rim of the giant Endeavour crater, the Opportunity rover examined a fractured rock unlike any it has seen during its nine years on Mars, researchers say. 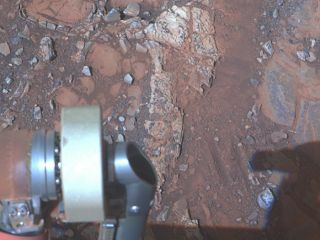 This mosaic of four frames shot by the microscopic imager on the robotic arm of NASA's Mars Exploration Rover Opportunity shows a rock target called "Esperance" after some of the rock's surface had been removed by Opportunity's rock abrasion tool, or RAT. "Water that moved through fractures during this rock's history would have provided more favorable conditions for biology than any other wet environment recorded in rocks Opportunity has seen," Opportunity principal investigator Steve Squyres, of Cornell University, said in a statement. Compared with the composition of rocks previously probed by Opportunity, Esperance is higher in aluminum and silica and lower in calcium and iron, researchers said. And it has other unique characteristics as well. Earlier this year, NASA's Curiosity rover found that the Red Planet could have supported microbial life in the ancient past, based on a sample the 1-ton robot drilled out of a Martian rock. Opportunity did not have such luck in its early days, finding evidence for ancient wet environments that were very acidic and thus unlikely to have supported life. The older rover was guided toward Endeavour crater after NASA's Mars Reconnaissance Orbiter detected evidence there of clay minerals, which form in relatively neutral-pH wet environments. "Esperance was so important, we committed several weeks to getting this one measurement of it, even though we knew the clock was ticking," Squyres said. Opportunity had a deadline to meet last week to end its 20-month exploration of Cape York and set out for Solander Point, another site at the edge of the impact crater Endeavour, which measures 14 miles (22 kilometers) across. The Opportunity team plans to keep the golf cart-sized rover working there during its next Martian winter. Opportunity is poised to break the international record for distance traveled on another world during its 1.4-mile (2.2-km) drive to Solander Point. That mark is held by the Soviet Union's remote-controlled Lunokhod 2 rover, which traveled 23 miles (37 km) on the moon in 1973. The six-wheeled Opportunity broke the U.S. record last week when its total odometry hit 22.22 miles (35.76 kilometers) on May 15, NASA officials said. The previous U.S. mark was set in December 1972 when astronauts Gene Cernan and Harrison Schmitt drove 22.21 miles (35.74 km) across the lunar surface on the Apollo 17 moon rover.